Clever bird book to engage a new birder. 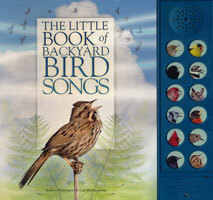 Learn to identify simple bird songs. Aged 3-8. Replaceable 3 x 1.5 V AG13/LR44 batteries included. Pinnington and Buckingham. board book. 24 pages. 2016.